This entry was posted in Problems (math) and tagged algorithms, complex fractions, division of fractions, fraction division, fractions, math for elementary teachers. Bookmark the permalink. Christopher, here are some thoughts on the subject. I’m not entirely sure whether I’m actually saying anything new or different compared to what you wrote in your notebook, but here goes. 2. Now let’s consider 3/2 divided by 3/4. The quotient is some number k, such that 3/4 times k = 3/2. So what algorithm is needed to “change 3/4 into 3/2?” Let’s explore. 3. We start with 3/4. We then take a third of that, and get 1/4. We then scale that up by 4, giving one whole. So far: (3/4) * (4/3) = 1 whole. 4. We now have one whole. To get to 3/2, we divide in half, then take 3 of those. i.e. 1 * (3/2) = 3/2. 5. All together now: to get from 3/4 to 3/2, we do this: (3/4) * (4/3) * (3/2). The answer is 3/2. Thanks for the opportunity to reflect on fractions. I love diving down into the lower math stuff (I teach high school). Any thoughts on my thoughts? 1. Let’s start with the simplest “common numerator” situation, i.e. dividing unit fractions. Consider (1/3) divided by (1/4). My argument above (see previous comment) shows that the quotient is (4/3). 2. So now let’s consider (2/3) divided by (2/4). First, some background with whole numbers, since they are easier for me to wrap my mind around. 3. If 30/10 equals 3, then 60/20 must also equal 3. i.e. 30 peanuts in 10 equal piles yields 3 per pile. If my large pile is twice as large — 60 peanuts — and my smaller piles are twice as large — 6 piles — then there ought to be the same number of piles. Put another way — say you have a drawing that shows 30/10 = 3. Partition a piece of paper in 3 parts and draw 10 per box, say. Now just photocopy that drawing — the composite drawing now shows that 60/20 = 3. Want to scale it up some more, to say 150/50? Just need 5 copies of that original drawing. 4. So point #3 establishes that scaling numerator and denominator preserves the quotient. So let’s apply that observation to the problem in point #2: (2/3) divided by (2/4) must be (4/3), since this the quotient of (1/3) and (1/4) is (4/3), per point #1. I think this is kind of the essence of your comparison argument as well. I note that is hinges on being able to divide unit fractions: what is the simplest way to make sense of this sub-class of problems under consideration? The simplest case of “dividing fractions with a common numerator” is something like this: (2/3) divided by 2. Since 2/3 is “take one whole; divide into 3 equal parts; take 2 such parts,” it follows immediately that (2/3) divided by 2 is (1/3), (4/5) divided by 4 is (1/5), etc. So how then do we divide (2/3) by (2/5)? Well — what is 2/5? It is 2 wholes, divided into 5 equal parts. i.e. the number (2/5) is 5 times *smaller* than 2. Therefore, (2/5) should divide into (2/3) exactly *5 times as many* as 2. i.e. Since (2/3) divided by 2 is (1/3), it follows that (2/5) divided by (2/5) is 5 times as much as (1/3), which is (5/3). Thus, (2/3) divided by (2/5) is (5/3). A similar argument shows that (99/3) divided by (99/5) is also (5/3). And that (a/b) divided by (a/c) is (c/b). Wow! Thanks for the thoughts, keyjames. Clearly it’s going to take me some time to work through these. In the meantime, any thought that begins with Something I know about division… gets my attention. I work tremendously hard to get my future elementary teachers (and my colleagues at a variety of levels) to connect algorithms to what they know about operation x. I am delighted when others are making the importance of these connections explicit. So, thanks for that. Am I missing something here, or has no one mentioned that if you divide fractions with common denominators that the denominators no longer matter and that hence you wind up “merely” with the ratio of the original numerators? That is to say that a/b / c/b = a/c, and it seems almost superfluous to multiply the compound numerator and denominator by the reciprocal of the denominator (“invert and multiply”). I would suggest that the ratio of “a pieces of size b” to “c pieces of size b” should be exactly what it is: a/b or a:b. To my way of thinking, this isn’t an algorithm but an insight into division and fractions and ratios. Now, it’s trivial to look at the case of common numerators with different denominators ( a/b / a/c ) and conclude via algebra that this must equal c/b. But it’s not quite so obvious what this means and is definitely worth considering. Perhaps everyone here already knows all of this, in which case my apologies. MPG, did you use the term trivial? I have put a prohibition on that word here. But on the substance of your comment, I think the distinction between algorithm and insight is a useful one. The common denominator algorithm is an algorithm for sure: (1) Take two fractions, (2) Change the form of one or both so that they have the same denominator, (3) Divide the numerators to obtain a quotient equal to the quotient of the original fractions. That’s an algorithm by any definition, just as is the standard algorithm: (1) Invert the second fraction, and (2) Multiply the first fraction by the inverted second one. When my future elementary teachers explore the common denominator algorithm, they are more likely to use invert and multiply to justify it. But that algorithm has no basis in concepts for them, so the argument is procedural rather than connected to things they know about division, fractions and ratios. As for the triviality of the common numerator case, it does sometimes seem the case that sometimes algebraic proof fails to bring out the concepts. And that is exactly what I’m trying to work out in the images in this post. That’s legitimate thinking going on there, not a processed explanation. So no worries. Not everyone here already knows all this stuff. Thanks for thinking with us. @Michael, your explanation regarding (a/c) / (b/c) is crystal clear: the ratio of a pieces of size c to b pieces of size c must be a:b.
I think I’m making progress finally. Don’t know why it took me this long to summon George Polya’s advice: start with the simple cases! In this instance, a “simple case” is one for which the denominators are multiples of each other, specifically (a/b) : (a/c), where b divides evenly into c.
How about (3/4) / (3/20)? i.e. “how many times does 3/20 go into 3/4?” This time I abandoned “pie diagrams” and just used a vertical rectangle. 1st picture: partition into fourths and shade 3 parts. 2nd diagram: partition into 20 parts and shade 3 of ’em. I even found this visual insight: I can shade *whichever 3 parts I want. * So — like label them #1-20. I shaded part #1, part #6, and part #11. Now it’s clear that diagram #1 has 5 times as much area shaded as diagram #2, so the answer is 5! I think you need to look at the context of my comment to appreciate that it was actually appropriate. I wrote “Now, it’s trivial to look at the case of common numerators with different denominators ( a/b / a/c ) and conclude via algebra that this must equal c/b.” My point is that if we use algebra (which, let’s face it, is what justifies the “invert and multiply” move for simplifying compound fractions in the first place), it’s not particularly a gigantic leap to go from a/b / a/c to c/b. But note well that I immediately follow that with, “But it’s not quite so obvious what this means and is definitely worth considering.” And that was why I called the algebraic move “trivial”: it’s not a slam-dunk that once you realize that you can do that and you get the simpler fraction, you wind up with any insight into what the heck it means. In the “invert and multiply” case, you’re told that it’s “all you need to do to divide by a fraction” or something like that. So you sort of know what it’s supposed to “do,” but as to “why it works,” you’re likely clueless. Ditto as to what your answer means in relation to the original problem, I suspect. What’s so nice about special cases like you’ve brought up in the two posts is that it helps (at least potentially) students focus on one part of the division process at a time. I think there’s definite opportunities to break it all down in ways that students (MIGHT) be able to make some sense of, before “putting it all together” into an a/b divided by c/d problem. Even there, you can work through simpler cases (maybe d divides b or c divides a) towards more puzzling ones (no common factors – a, b, c, and d are relatively prime). I think it’s great that you’re raising this issue with would-be teachers. I’ve tried to do that, as well with elementary, middle school, and high school students. There are some nice things you can do with linking cubes to model this (purloined lessons available upon request). Finally, I only use “trivial” and its cousins regarding mathematics in special cases and when not speaking to students – be they K-12 or teacher education students. Here, I guess I was both trying to crack a mild joke (unaware of the proscription in effect, by the way) and make a point already explained above: that doing the algebra may work, but it doesn’t always give us immediate insight as to meaning. Hi all, I stumbled here via Google. 2nd year grad student here, and I taught my first education class this semester: Fundamentals of Math for Primary Educators. Now, I’m a theoretical math (algebra and combinatorics mainly) guy, so this was quite different from your average remedial high school math class for college students, but that’s another story. The main reason I’m posting is because I had a late realization that I’m disappointed I wasn’t able to attempt to convey to the class, and tried it out on this example. Judging by your multiplication of fractions diagram, I think we covered fractions similarly, perhaps division in general. So dividing, we had two mind sets: “sharing” and “repeated subtraction,” only the latter easily adaptable to handle fractional division answers. I’ve come to realize this is closest to what I think of as mathematical quotient. This is the realization I had too late. For example, if we divide 12 by 4, we can share 12 things with four people, each getting 3. Repeatedly subtracting, we know that we can take away 3 groups of four, interpreting 3 as our answer. I also took my first topology class, just barely touching on quotient spaces. The main idea is that we consider certain points “the same” and the quotient is what’s left after our identifications. 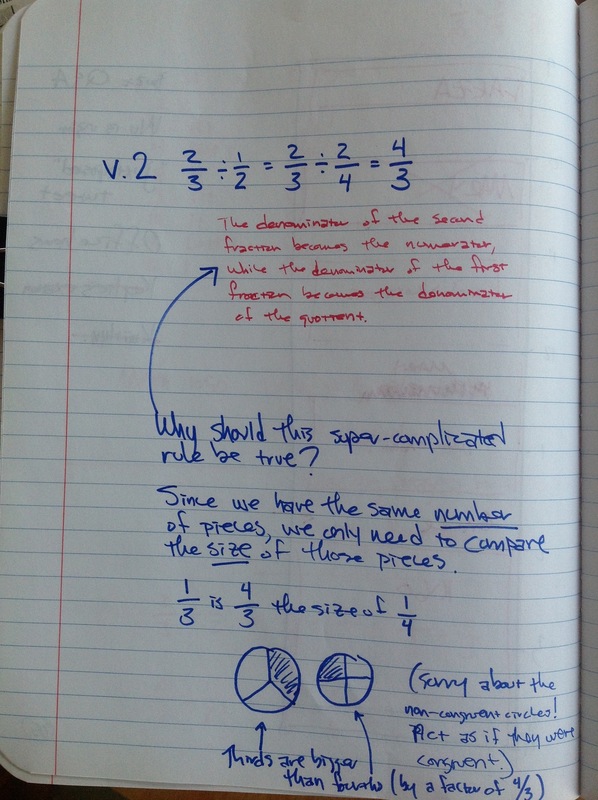 Then it occurred to me that this is essentially what we’ve done with repeated subtraction: we can take away 3 groups of four, or we can “smash together” four things turning them into one, so that with 12 total, we can smash 3 full times, leaving our answer of 3 super-dense units. How can this be used to divide by fractions? Well, dividing by four, we declare four of our old units equivalent to our new unit. So in the 2/3 divided by 1/2 example, it seems reasonable to declare each half of our old unit to be a new unit. It seems nice to say that we start with 2 one-thirds and consider a single one-third as the old unit, of which we have 2. Continuing the integer division analogy, we see that each old one-third yields 2 one-thirds, for a total of 4 one-thirds as the almighty answer. Interestingly, this view suggest that “invert and multiply” is a natural mantra: dividing by the integer 4, we simply collapsed four pieces together. Dividing by the reciprocal 1/2, we really did just multiply by 2, by splitting each one third into 2 one-thirds. So perhaps this isn’t a great conceptual framework for divisions with the same numerator as dividing by reciprocals of integers. Either way, I wanted to see if standard division could be be explained ‘better’ by keeping more advanced quotients in mind, and whether this would be enlightening. I think a 2×3 grid is probably the appropriate place to “see” the symbolic answer of 4/3. Welcome, ReadEuler. I’m glad you found us. You discuss a number of themes that are recurring on this blog. If you haven’t looked around, please do so—there’s lots for you here. Good way to begin is to hit that “math for elementary teachers” tag on the right-hand side of the page. 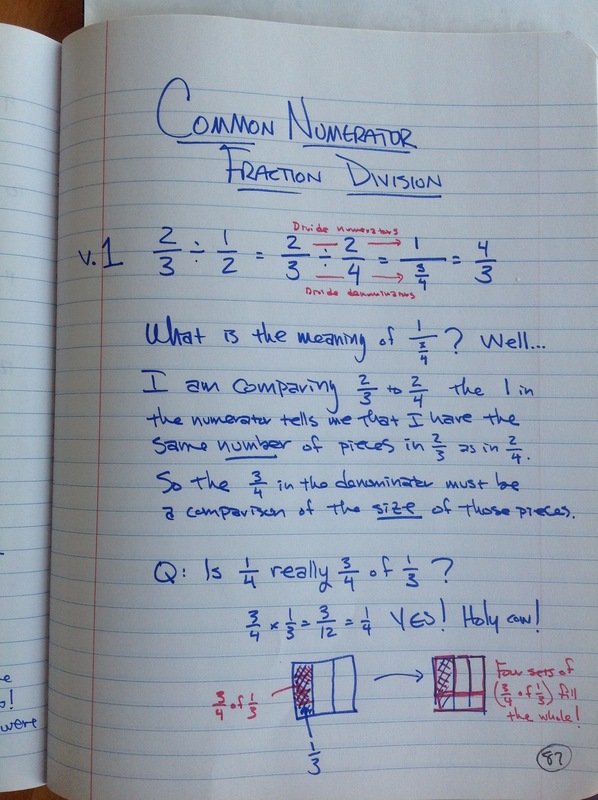 And if you missed the follow up partitive fraction division post, you’ll want to look into that, too. To me the common numerator division works best when I think in terms of ratios: I know that a/b divided by a will be 1/b. If I divide by something that’s c times smaller, it makes the quotient c times bigger, and so a/b divided by a/c will be 1/b * c which is c/b. To me, this is much more satisfying than the “divide across to get 1/(b/c) and then use the reciprocal property to get c/b”, since the dividing across is roughly equally intuitive to me as the ratio argument, and the extra step of the reciprocal makes this second method more opaque. So, proportional reasoning works for me here. I’d sure like to have a convincing visual, though! The visuals that I commonly use for fraction division work a lot better with common denominators than common numerators. I do like the focus on the size of the pieces, on your second page. The inverse proportionality between the size of the pieces and the denominator of the fractions is a good intuition here. I still can’t quite get it into a nice visual without making common denominators eventually, though, for instance with a rectangle divided horizontally into b pieces and vertically into c pieces so that I can see why the ratio of the piece sizes leads me to c/b as the result.